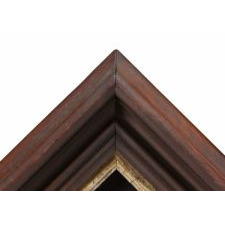 Dimensions (inches): work - 17.5" x 15", frame - approx. 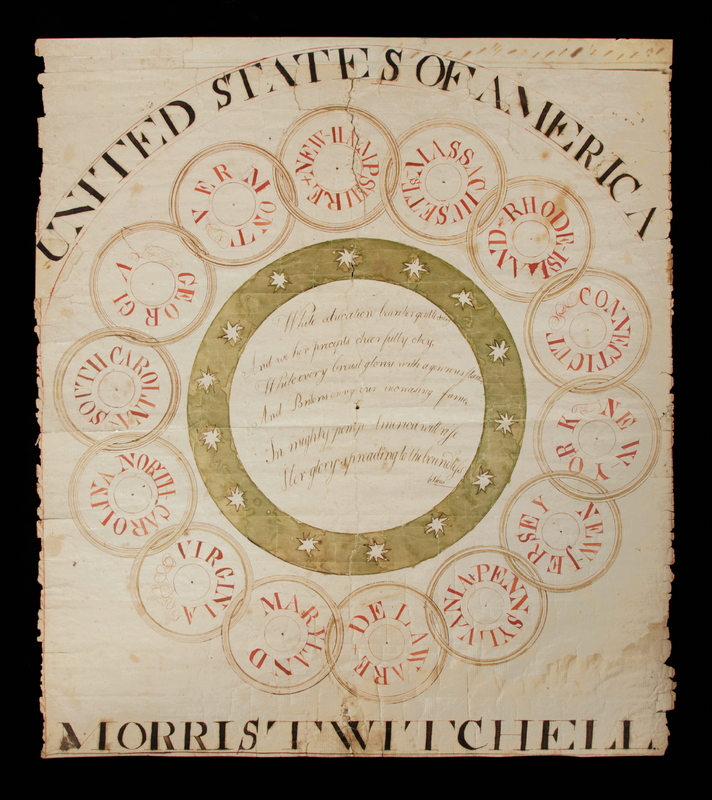 26" x 24.5"
Executed on laid paper, this beautiful patriotic pen and ink, watercolor fraktur drawing, entitled "United States of America," was signed by schoolchild Morris Twitchell. The graphics illustrate the 13 original colonies as states, plus Vermont, which joined the Union on March of 1791. Because Kentucky followed as the 15th state in June of 1792, just 15 months later, the time in which this work could have been completed falls to within a very narrow window of just 1-year-and-3-months. 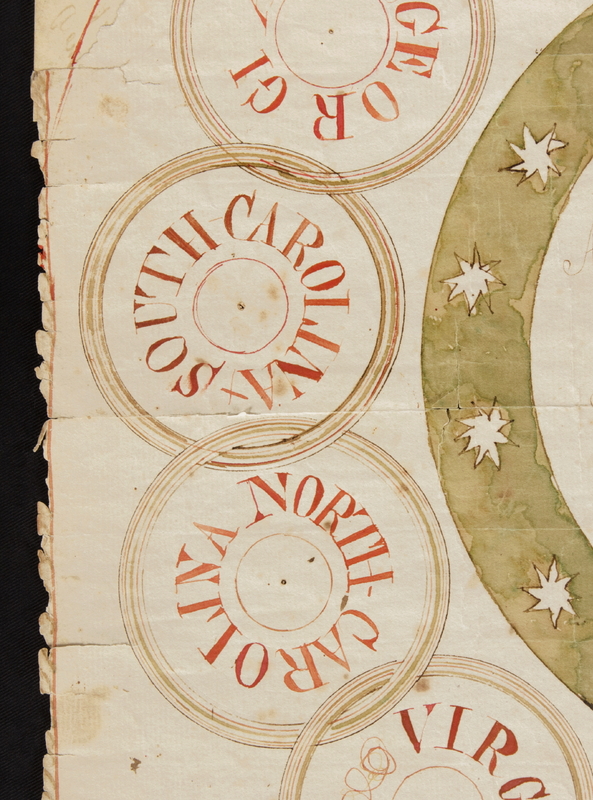 The imagery beneath the arched title consists of a series of conjoined rings, gracefully drawn with a compass in scarlet red, lime green (perhaps once blue) and sepia. Inside these are the names of each state in red capital letters. Note how in instances where extra space remained that nondescript squiggles in red and green were used to fill some of the spaces in a naïve decorative fashion that demonstrates school child creativity. Others received a crosshatch or nothing at all. In the case of Massachusetts, the "s" at the end was forgotten and added after the fact. Inside the rings is another single ring, in green, with 14, crudely drawn, 8-pointed stars. 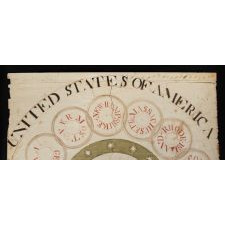 Even though the the specific words do not appear, each of these images illustrates the basic American concept and motto of "E Pluribus Unum" (out of many, one). 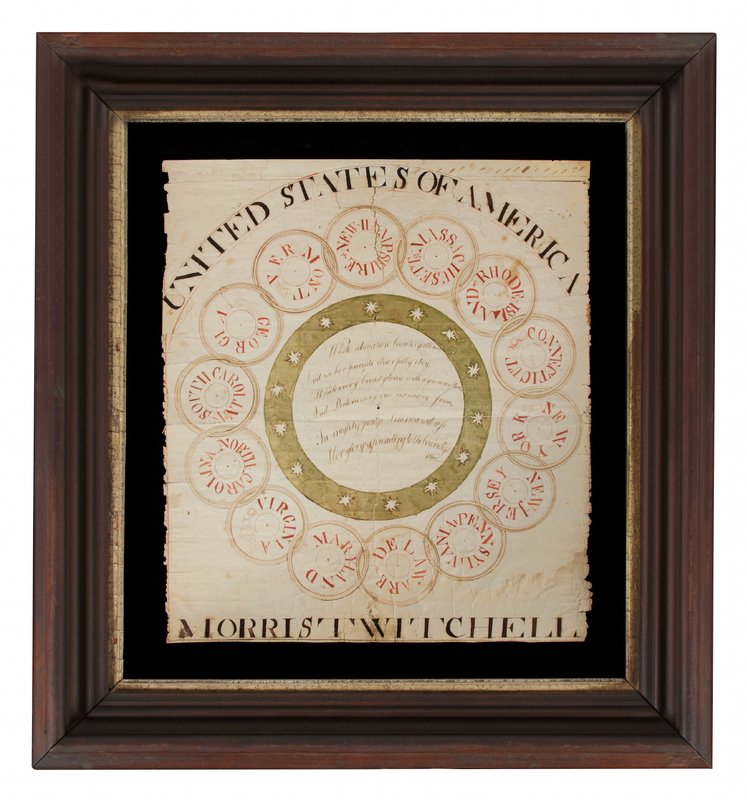 The basic design seen here was a product of Benjamin Franklin and first appeared in public on fractional American colonial currency, printed in Philadelphia by Hall & Sellers in 1776. In the center of similar conjoined rings, which number 13, is another ring inside a 13-pointed sunburst. In the very center are the words "We Are One," surrounded by "American Congress." 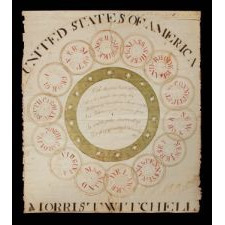 With the exception of the absence of Vermont and the position of Connecticut, the colonies/states appear in the same order on both this schoolchild watercolor and the Hall & Sellers currency. The imagery is later seen on a famous illustration printed by Amos Doolittle of New Haven, Connecticut in March of 1798, entitled "A Display of the United States of America. To the Patrons of Arts and Sciences, in all parts of the World." 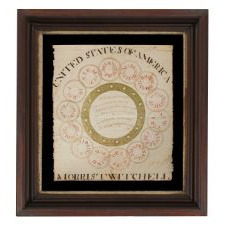 There are 14 rings in the Doolittle illustration, which excludes the newest states of Vermont, Kentucky and Tennessee, but instead includes the Great Seal of the United States at the very top. 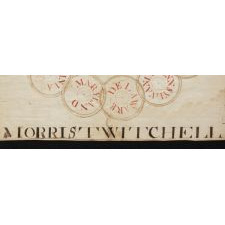 A boy by the name of Morris Twitchell was born to Benjamin and Patience (Tucker) Twitchell of Bellingham, Massachusetts in 1774. Morris would have been 17 in 1791 and this would be the correct period. 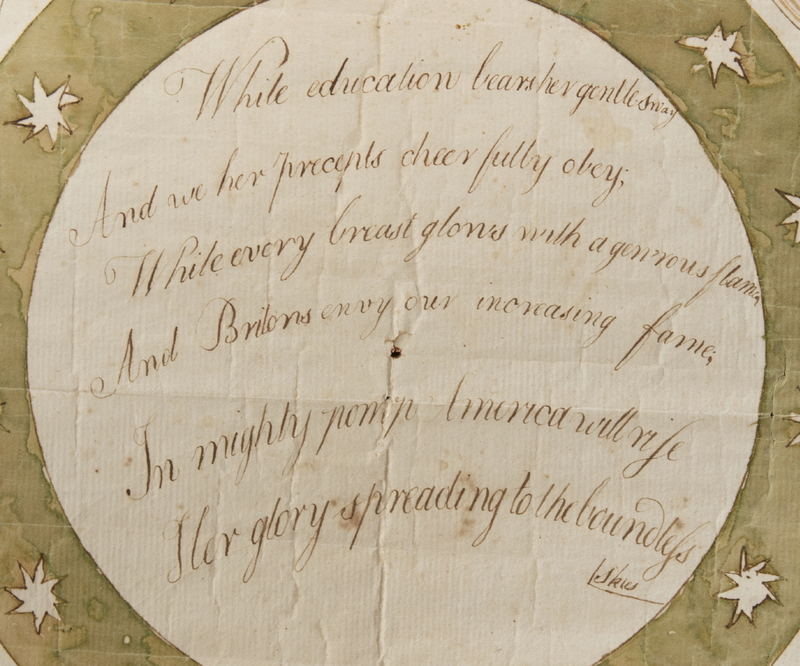 These words of Twitchell's verse appear on the title page of a 1779 book that is believed to be the first purely English grammar ever written and published in America, and the first book ever published in Vermont, and the first by a Dartmouth graduate. Only one copy of the book is known. The title page reads as follows: "A compend of English Grammar; being an attempt to point out the fundamental principles of the English language in a concise and intelligible manner, and to assist in writing and speaking the same with accuracy and correctness. Written by Abel Curtiss, A.B." This is followed by the verse, which is followed by "Dresden, Dartmouth College. Printed by J. P. & A. Spooner, 1779." It seems likely that Twitchell was enrolled at a school that used the Curtiss text and copied the verbiage from it onto this patriotic drawing. 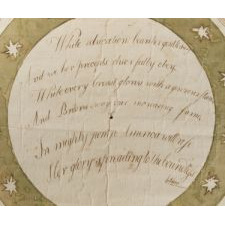 In summary, I have seen very few 18th century fraktur drawings with such great patriotic American imagery and verse. 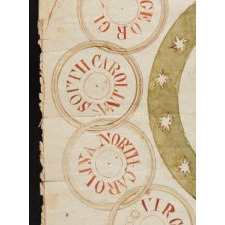 Franklin's way of displaying the early states by conjoined rings is readily recognized by students of early American history and exciting to see in a period schoolchild illustration, especially one of such large scale and one that can be so readily dated to a 1-year time frame. This is a treasure among 18th century American illuminated documents and a museum-worthy find. Mounting: This is a sandwich mount between 100% cotton twill and U.V. protective Plexiglas. The black fabric has been washed to reduce excess dye. An acid-free agent was added to the wash to further set the dye and the fabric was heat-treated for the same purpose. 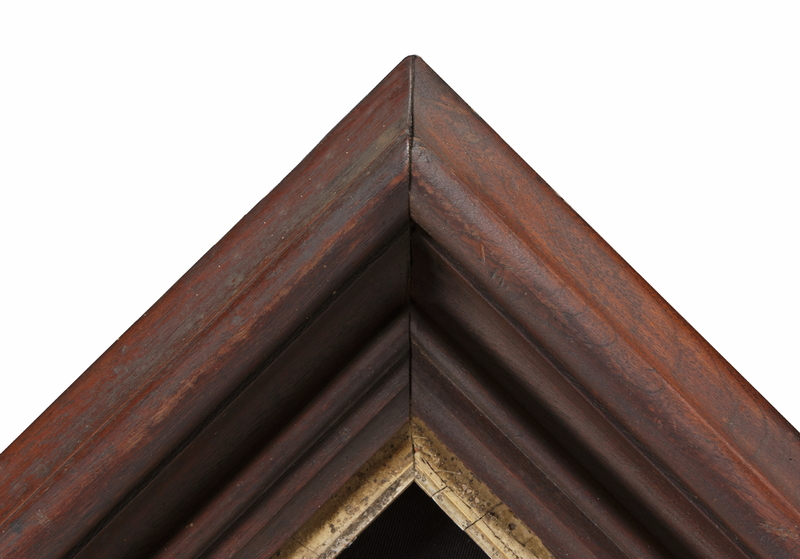 The mount was then placed in a substantial, solid walnut frame with a great early profile and a gilded liner, that dates to the period between the late 1850's and 1870. Condition: There are various tears and losses. Along the top a 3/4-inch strip is absent for about 2/5 of the ditance, along with a notch that extends down into the letter "E" in "States." This was patched with a piece of parchment from an early copy book. The same was done to a loss along the left edge that extends into the letter "U" in "United." There is some water staining, foxing, bleeding, fading and soiling, but the overall presentation is wonderful with great patination.